ESPN confronted the politics of Trump and race head-on Sunday. The network began its pregame show "Sunday NFL Countdown" with a discussion about President Trump's incendiary rhetoric about NFL players who protest during the national anthem. One of the show's regulars, former head coach Rex Ryan, said he supported Trump and introduced him at a campaign event. But he was visibly angry when talking about the president's comments. "I never signed up for that," Ryan said. "I never wanted that. That doesn't mean I support 100% of the things that he says and clearly this is a case." The protests were started last season by Colin Kaepernick, who dropped to one knee during the national anthem before games to protest the treatment of African Americans, especially by police. 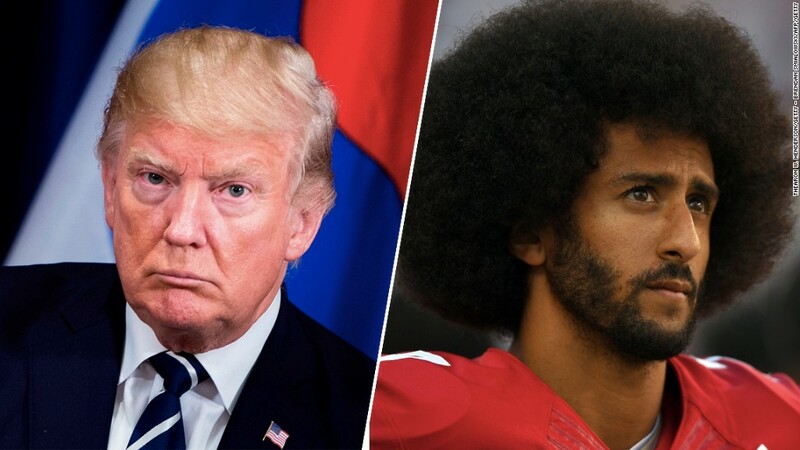 In a speech on Friday night, and then in a series of tweets, Trump has said the NFL should fire any player who protests during the national anthem. Team owners and players have responded by condemning Trump. Many players vowed to protest on Sunday. Ryan said he had gained a new perspective on the protests. "I looked at it from a different standpoint. I looked at it from all the men and women who stood for our country," Ryan said. "I was wrong when I looked at it initially. Now this year, I look at it as it's a far, far greater thing than just that." He said he now recognizes "the greater picture of it." Former NFL player Charles Woodson added that it's "unbelievable that after nearly 400 years of slavery, we're still going through this. Still. And not just from anybody" but from the president. Show host Sam Ponder pointed out that Kaepernick has not been signed by any NFL team to play this season. "He's still at home watching these games on TV," she said. "We can hope that people don't shy away from the conversation." Former wide receiver Anquan Boldin said that "there's a misconception about the kneeling. We're protesting inequality. We're also standing for slain police officers." He said "we all recognize that we live in a great country, but that doesn't mean that it doesn't need to be worked on." "It's unfortunate that it's taken this to see where guys are coming from." Former quarterback Matt Hasselbeck, who is white, also said his perspective had been affected. He said he used to view the anthem from the perspective of military veterans but had started to see it from the side of African Americans. "I don't know what it's like to be Randy Moss at 17 years old," he said, referring to a fellow member of the show. "That's kind of what has changed for me this year." Moss, who is African-American, said he appreciated Hasselbeck's comments. At one point, he leaned over to shake Hasselbeck's hand, calling him "brother." Earlier this month, ESPN was in the middle of a political firestorm after anchor Jemele Hill tweeted that "Donald Trump is a white supremacist who has largely surrounded himself w/ other white supremacists." Conservative media outlets, including Fox News, accused ESPN of political bias. Trump jumped in to trash talk ESPN on Twitter. After several days of headlines, ESPN President John Skipper sent an internal memo reminding his staff to focus on journalism and not politics. An ESPN spokesperson said Sunday morning's pregame discussion was on point with the network's mission. "If you read Skipper's note he said we would -- as we always have, really -- cover the intersection of sports and politics," the spokesperson said.